March 7th, 2010, a day forever marked by two little guys both starting with “O”: Oscar, the little gold Academy Award in my hand below and Owen, the little miracle I just learned was coming into the world. “Congratulations!” they said as they handed me the gold statuette. It felt both cool and warm in my hands – probably because it was metal and people had been manhandling it for the last hour. I kept my acceptance speech short, but of course started with “I would like to thank the Academy”. 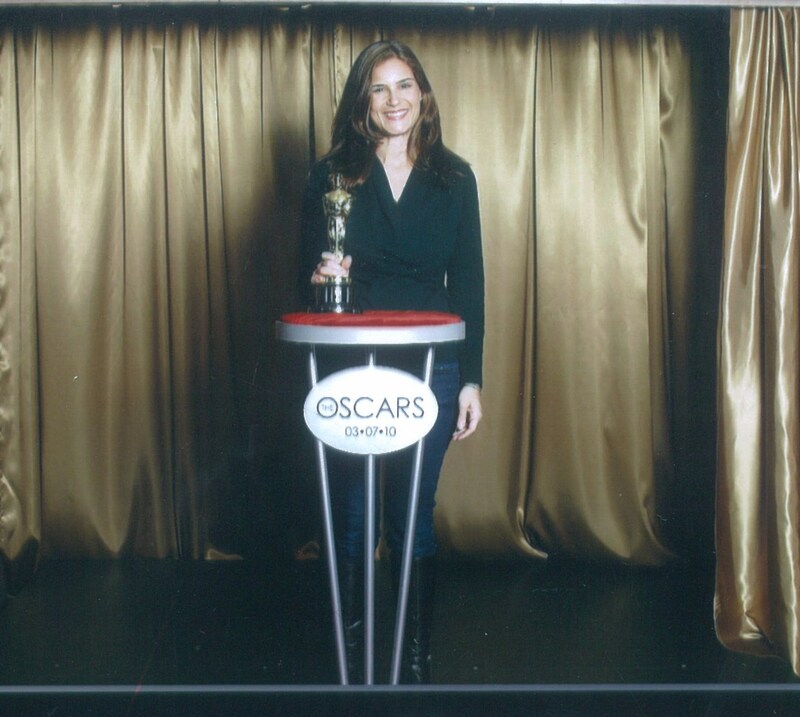 In case you can’t tell, the cheap gold drapery and Bush league podium were not actually from the Academy Awards. Kodak sponsored the event at the Time Warner Center, which happened to be located across the street from my doctor’s office. Tonight I will be tuning in again to watch the Academy Awards where the Hollywood elite will bring the glitz and the glam, and, I suspect, a lot of politically-charged speeches. I know, cue the eye-roll. After feigning shock that they won and proclaiming it’s an honor to work with so-and-so, who is “such a genius”, the stars will likely make a comment about our current administration and the freedoms that are dangling before us. If I had a podium and that audience, I hope I’d say something, too, joining in the effort to preserve free speech. Even though these stars aren’t like us regular people, we rely on them to bring stories – thought-provoking or adrenaline-packed stories to help us escape and help us relate. We rely on them to help create worlds that we find just believable enough. We rely on these stories to give us hope and let us live, however briefly, in another world. And we hold these people to high standards of authenticity. Look at last year’s Best Picture nominee, The Martian, starring Matt Damon. The movie was based on a book written by Andy Weir, who wanted to tell a story of an astronaut stranded on Mars and what it would take for him to figure out how to survive. Mr. Weir offered his story in installments on his own website – for free. He was so precise in his storytelling that he wrote computer programming, solved mathematical problems and researched how to grow potatoes just to make the story more believable. His research for the book was so detailed that teachers begged for him to remove the profanity and create a textbook to teach students about physics and mathematics. See the New York Time’s article from Saturday that explains more: here. I would like to thank the Academy for giving me an award show that takes me away from my average life for at least 4 hours one Sunday night each year. I would like to thank the E! news channel for providing great guilty pleasure entertainment. I would like to thank my husband for permitting me to make this Sunday my Super Bowl Sunday – a day that is planned around a lengthy television program complete with I-shouldn’t-eat-that food and extra imbibing (yay Champagne!). I would like to encourage those in power to protect free speech, continue funding for the arts and to think out side of the box in terms of teaching our children. Also, I’d like to see more awards shows for actual geniuses in all sorts of fields: Best Plumber, Best IT Support Team, Best Researcher, Best Teacher, Best Stay-at-Home Mom, etc. I am grateful for storytellers and hope we all continue to share our voices and look for ways to connect. Posted in Writing.Tagged Academy Awards, entertainment, Family, free speech, life, Movies, Oscars, storytelling, the arts. Honestly – your blogs get better and better! For a left brain number smart person, you certainly are clever, witty, and a very entertaining writer. BTW – what a great picture of you (and not the Sandra Bullock one). Keep writing – I love it. Another great post! And I have always thought you look like Sandra Bullock! I never even knew you posed with Oscar. Well in my book, you deserve one for the best oldest daughter.